What a busy and fun summer it has been! The last 6 weeks have been a blur but a very memorable blur. Also, to be stated early on in this post, everyone please be sure to congratulate Maggie Trujillo and Mike Oxendine on their very exciting and very big life news. Just in the last few weeks, they both have accepted new jobs! Maggie, currently executive chef at Larks in Medford, will be moving to Seattle to open a brand new and very nice restaurant (name to be announced soon) where she will be the executive chef. This is an amazing opportunity and I know she’s rightfully super excited about it. And Mike Oxendine will be the new Parks Superintendent for the Ashland Parks and Recreation Commission. Again, he too is rightfully very excited about this new chapter in his career. Congratulations to both of you on this most exciting and excellent news!!! We’re very proud of you both! 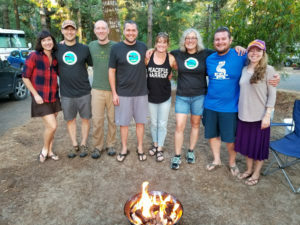 It has been a while since I last sent a SOMA email and I had intended to follow up sooner after the Applegate Lake Swim which ended the “My Oregon Swimcation” (3 championship swims in one week) but time got away from me. So I apologize for the length of this email, but I wanted to share some really great news and information about the successes people had over the summer. Oregon Masters Swimming hosted three national championship open water events in one week, starting with the 11-mile Portland Bridge Swim on July 8th, continuing with the 2-mile cable swim at Foster Lake on July 12th and finishing with the Applegate Lake 10K on July 14th. All three events were immensely successful and a ton of fun. There were 2 SOMA swimmers who swam the Portland Bridge Swim. Leah Harris and Mike Oxendine both successfully completed this daunting (crazy?) swim down-river through downtown Portland. This is a monumental accomplishment and I’m very proud of them and happy for both of them for taking on this challenge and crushing it! 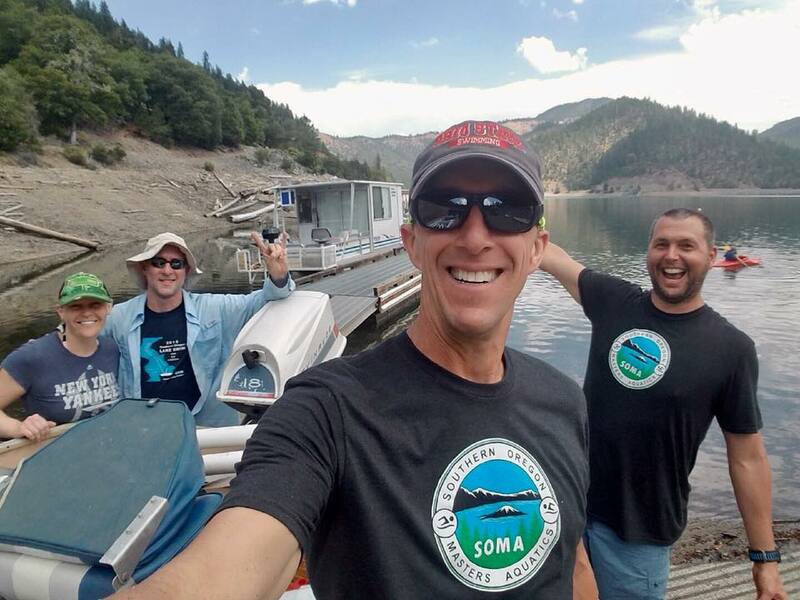 On Thursday, July 12th, four of us from SOMA headed to Foster Lake for the cable swims. The group included Linda Parmentier Nesbitt, Jayette Pettit, Mike Oxendine and me. All four of us did the 2-mile national championship and swam very well. Jayette and I did the 1-mile cable swim as well, which was the Oregon Open Water Association Championship. The two-person SOMA open water state team of Jayette and me was able to eke out 3rd place in the small team category with both of us winning our age group! The swimcation week culminated here in Southern Oregon at Applegate Lake with the 10K national championship swim, but also offering 2.5K, 5K and 1500-meter swims for which I was the race director and Mike Servant served as the co-race director on shore during the event so that I could swim the 10K on Saturday. Thanks, Mike! There were 12 of us from SOMA who entered one or more event! What a great showing! And there were quite a few others who came out just to help run the event, which was very much appreciated. The event went exceptionally well. 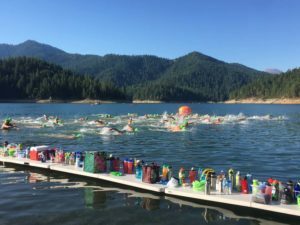 Swimmers compete in the USMS Marathon-Distance Open Water National Championship in Applegate Lake in Oregon on July 14, 2018. 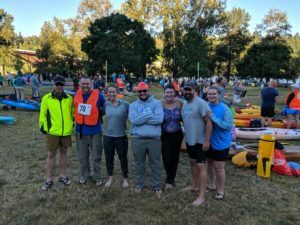 For a few SOMA swimmers, this was their very first open water swim ever. I know for Maggie Trujillo and Yeonjoo Lee that this was their first ever open water swim. And I believe that it was the first open water swim since childhood for Julie Hall and Dani Straw. Congratulations to all of them on finishing their first masters open water events! 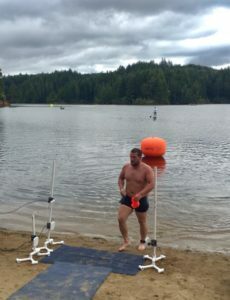 There was one SOMA swimmer who received special recognition at Applegate Lake for completing all three Oregon Swimcation swims, totaling more than 20 miles of swimming in open water. Congratulations, Mike Oxendine, on a super impressive week of swimming!! Eight SOMA swimmers made it to the Gil Young Memorial Meet held the weekend after Applegate Lake on July 20-22. 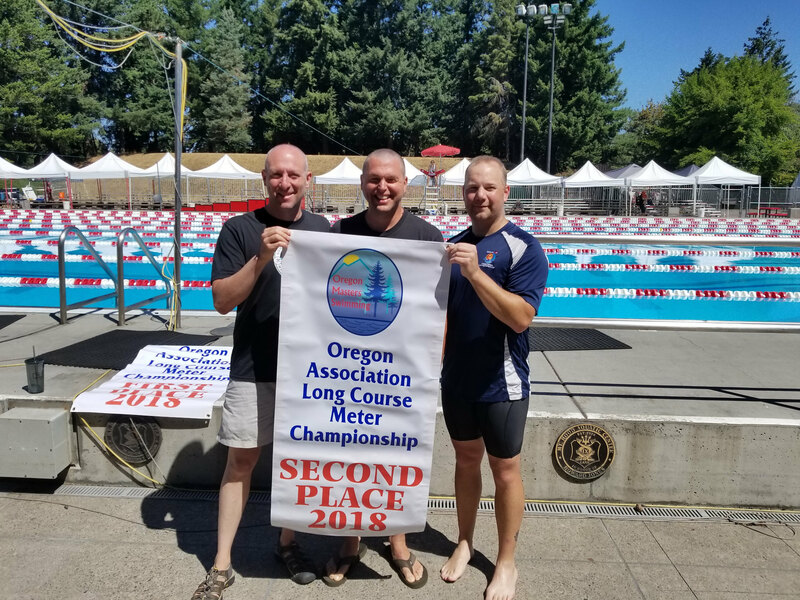 We all swam our hearts out, representing SOMA well, posting some very fast swims that should hold up for national top 10 times, and coming home with the 2nd place team banner, just like we did at the spring Association Champs! Woohoo! We’ll keep working to take out Oregon Reign someday, but this was their home pool, so it was a tall order to surpass them at this meet. Let’s try again in April at short course Oregon Association Champs!! Mike Servant, Matt Miller and James Adams collect SOMA’s 2nd place banner! The weekend after Gil Young was the start of the swimming portion of the 2018 Pan American Games held in Orlando, Florida. USMS did not have a summer nationals this year, but rather decided to back and support the Pan Am Games. So the meet was very well attended, with nearly 2000 swimmers and lots of international competition from all over North America and with even a few people coming over from Europe to swim. From SOMA, it was only Willard and me who made the trip down to Orlando, along with Willard’s son Doug who goes by the title of “Willard’s lap counter,” at which he does a great job. Willard dominated the competition, again, swimming faster than most everyone within 10 years of his age and coming home with 5 gold medals, 5 Pan American Games records and one new world record in the 200 backstroke where he bettered his own world record set last year in Minneapolis. Congrats Willard! I swam very well too. Out of my 5 pool swims, three were new lifetime personal best times and two were 2nd best times ever. My highest showing in the pool was 3rd in the 800 free, but I placed in the top 10 in all of my pool events. 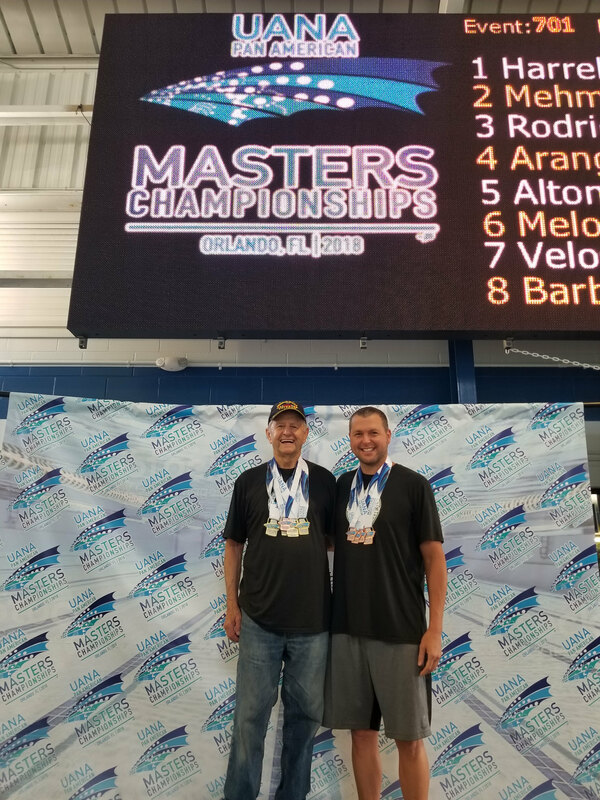 In the open water competition, held on Sunday, August 5th after the pool competition was over, I was able to put together an amazing swim in the 1500 and came out on top of my very competitive age group, besting the two guys who had beat me in the 800 in the pool. I was super happy with that performance!Willard, Doug and I had a great week of swimming and hanging out together, along with the few other swimmers from Oregon, down in Orlando. It was a very memorable and very fun trip and I look forward to doing another trip with Wink and Doug again soon! Willard Lamb and Matt Miller at Pan American Games in our SOMA shirts though you can’t see them through the medals! The weekend after returning from Orlando it was time to head over to the coast of southern Oregon to Tugman State Park for the Eel Lake Swims on Saturday August 11th. This was the first official event hosted by SOMA and it went off without a hitch. A huge “thank you” goes out to our SOMA contingent over on the coast, led by Jayna Tomac, who gathered the crew to come out to help with safety, kayaking and keeping a watchful eye on everyone as they swam. Also a big thanks to Linda Parmentier Nesbitt for getting snacks for the event, taking lots of great photos and helping with safety. Mike Dix also drove all the way down from the Rogue Valley to volunteer and helped immensely with timing and other duties. And there were many others who helped a ton. Thanks, everyone!! 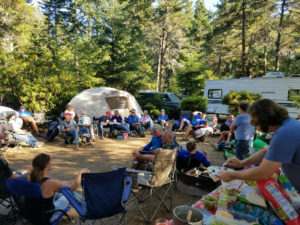 After the swims were over on Saturday evening, most everyone who came to the event attended the annual “Super Bowl” potluck party hosted by Dan Gray and Connie Shuman in the Tugman campground. It was a great spread, with excellent food and awesome company! We will do it again next year, so be sure to put this one on your calendar early and plan to attend this SOMA-sponsored amazing weekend!! The next Oregon sanctioned pool meet, the Hood River Short Course Meters (SCM) meet will be held in Hood River on November 10th. I plan to attend and I believe a few other SOMA people plan to go as well. OK, that’s all for now. I hope everyone is enjoying their summer despite all of the smoke here in southern Oregon. Fall is almost upon us and it is only a little over 3 months until the SCM meets start, so let’s get training and have some fun in the pool working hard together! Stay fit and strong, SOMA people! !